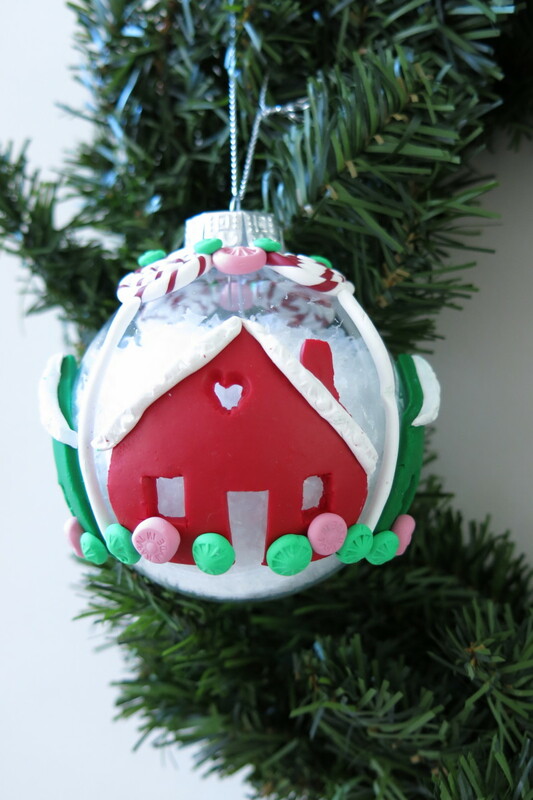 This cute polymer clay gingerbread house tree ornament is festive and fun for the holiday season! Bright colors and candy details make this sugary sweet abode a special decoration to cherish for years to come. This polymer clay tutorial is not difficult, but is best suited for those with clay experience or for adventurous beginners. 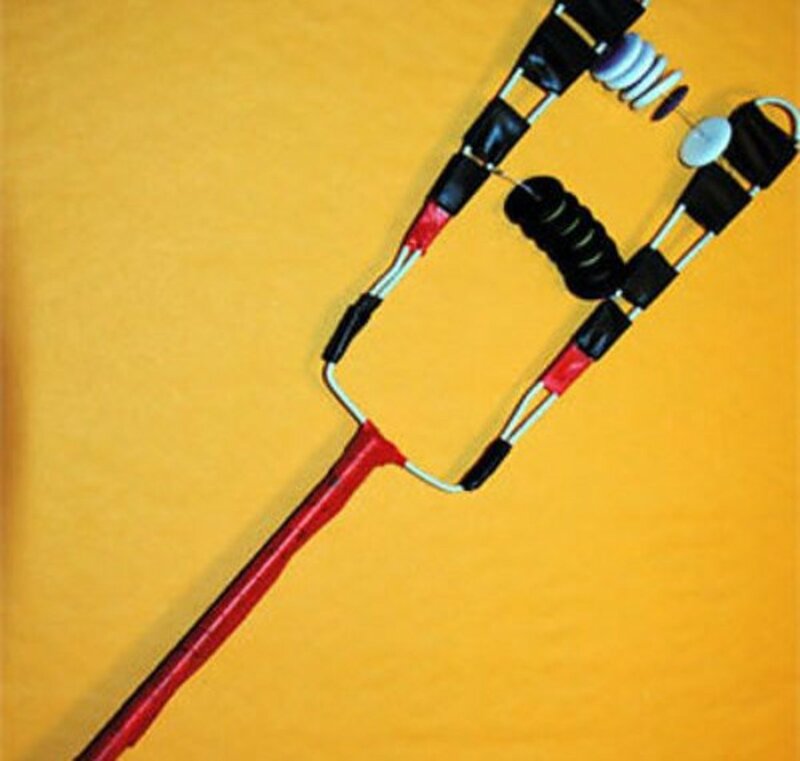 A note about polymer clay and clay tools: There are a few brands of polymer clay available in craft stores. 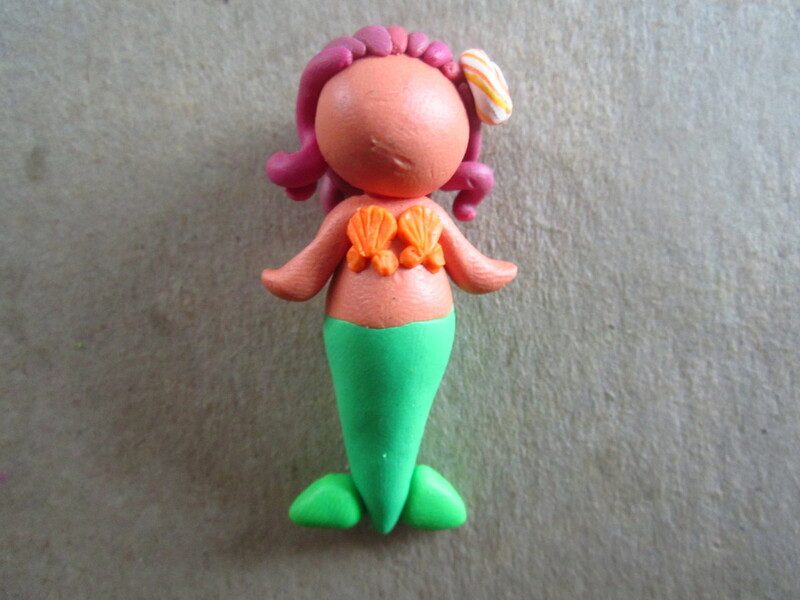 I used Sculpey brand which is quite malleable and easy to mold. I also like to use household items for my clay tools, although you can use pottery or ceramic tools if you have them. Do not, however, use any of your household items in the kitchen or with food, after you've used them with your clay. A clear glass ball ornament - these are available at most craft stores during the holiday season. The ornament must be glass (not plastic) to withstand the baking process with the clay. 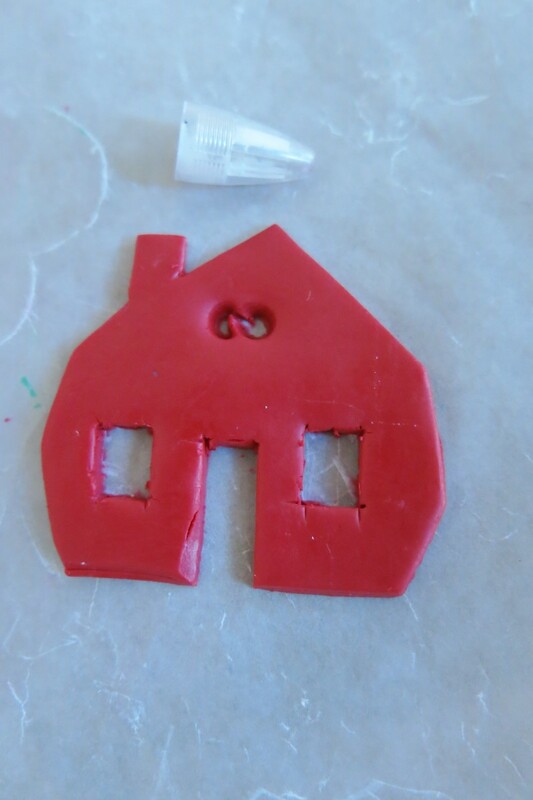 A few blocks of polymer clay in different colors - I chose to make my gingerbread houses out of red and green clay to make my ornament more colorful, but you can use a traditional gingerbread color too. You will also need a few other colors for the candy details on your house. 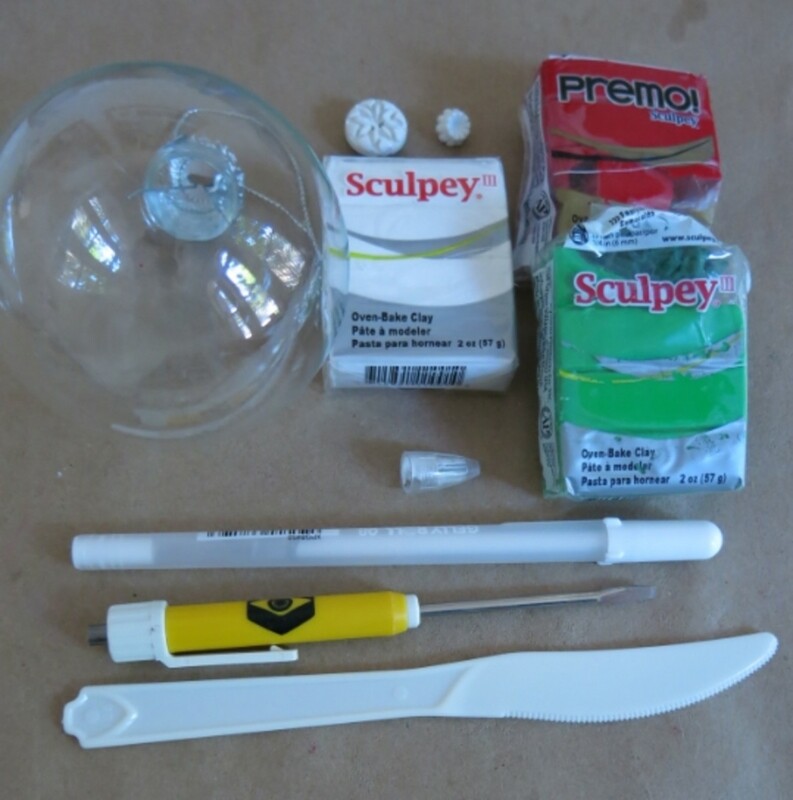 Household items for modeling your clay - these can include a small flathead screwdriver or pen knife, a plastic knife, some pens, and a few decorative buttons for stamping. (Optional) fake snow, glitter, or confetti to fill your glass ornament. Step 1. The first step to making a polymer clay tree decoration is to clean your glass ornament. To begin, remove the metal top from your ornament and put it to the side. Step 2. Next, clean the outside of your ornament with liquid dish soap or rubbing alcohol. As you clean your ornament, be careful not to get any liquid inside your ornament, as it can take a while to dry out. Be sure to only handle your ornament from the neck after you've cleaned it. Try not to touch the ball once it's clean. Cindy Lietz has some great information about preparing your glass ornament in a video on her blog. Step 3. You'll want to find a small cup or bowl to put your ornament in while your work on it. I like to use yogurt cups for this. Step 4. Then measure the diameter of your glass ornament at the widest part around your ball. This will tell you how many times you can repeat your gingerbread house around your ornament. My ball was 10 inches in diameter. I decided to create my gingerbread house to be about 2 1/2 inches wide so I could repeat it 4 times around my ornament. To begin your ornament, you will want to create a ring or collar of clay candy around the neck of your ornament. These clay pieces will connect to your other decorations to hold the polymer clay on your glass ornament. 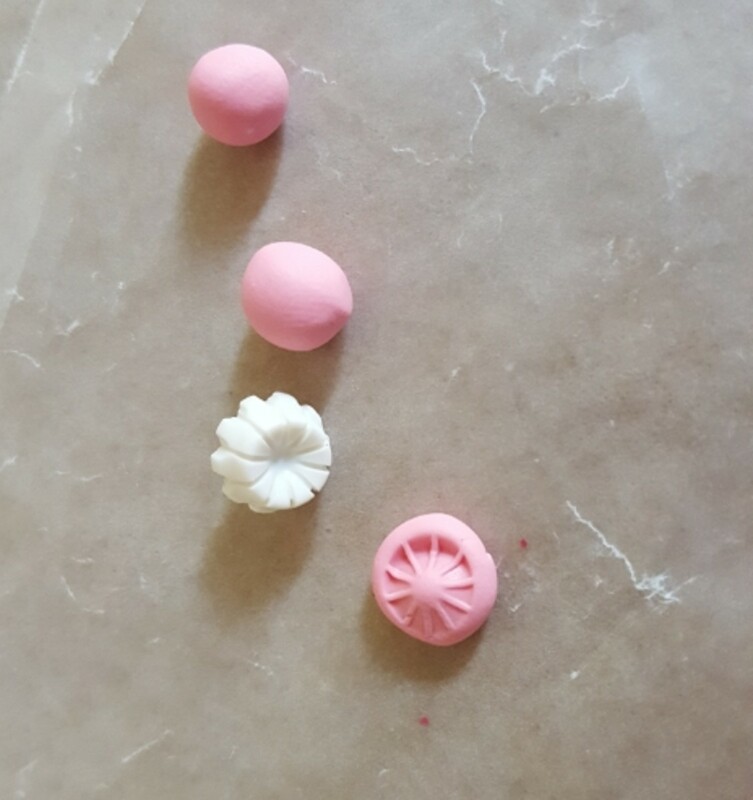 I made my clay candy to look like little peppermints and other candy drops. Step 1. Roll out two thin coils of clay, one of white and one of red (though you can use any colors you choose). I rolled these coils with my fingertips, but your can use a clay extruder if you have one. 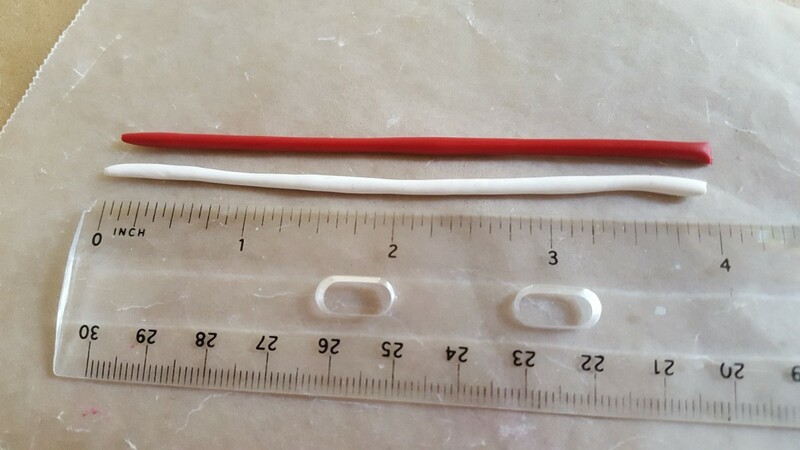 I made each one of my coils about 4 inches long to create a peppermint that was about an inch in diameter. Step 2. Then twist your two coils together like in the photo above. Step 3. Now roll your twisted clay into a thin coil using your fingertips and applying even pressure. Step 4. 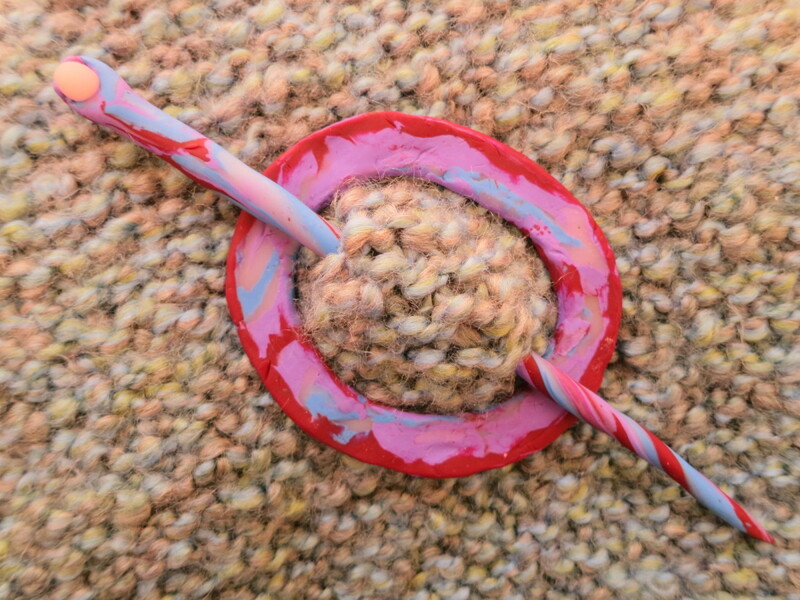 Next, roll your striped clay coil into a circle that looks like a peppermint candy. Repeat these 4 steps to make one peppermint for each of the repeats of your gingerbread house on your ornament. I made four for my ball. Step 5. 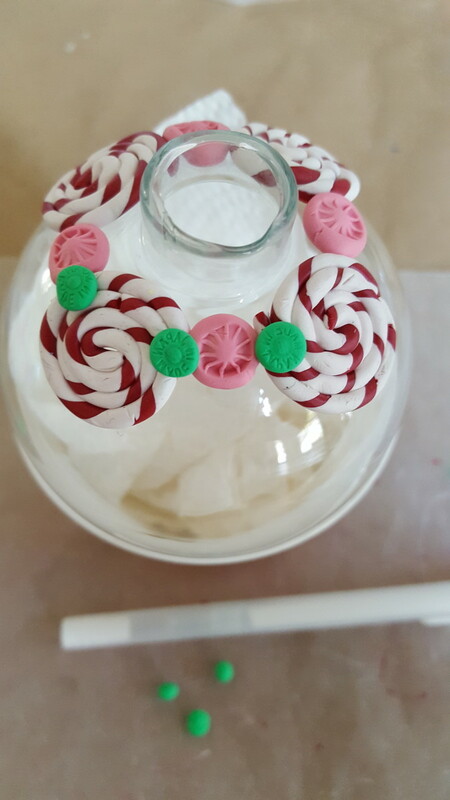 Place your clay peppermint candies around the neck of your glass ornament with even spacing. I put one at the north, south, east, and west positions on my ball. Press all your clay pieces firmly on your ornament until they stick, but be careful not to dent your clay or get fingerprints on your glass ball. Be sure to leave enough space at the neck of your ornament to put the metal top back on without interfering with your clay pieces. Step 6. 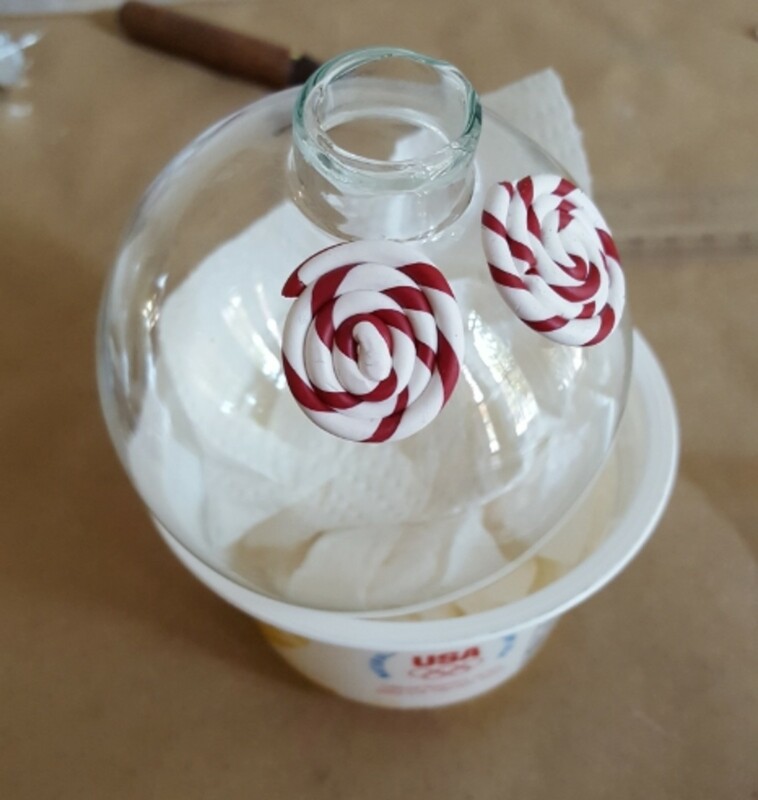 Now make a few small candy drops to place between and connect your peppermints to form a ring around your glass ball's neck. I just rolled some small balls of clay and stamped them each with a decorative button. You can use a couple of different colors to make these smaller candies. Step 7. To add more color, I made some green drops that I stamped with the end of a pen. These additional dots also secured the connection between my pieces of clay. Step 1. It's best to cut a paper template to use to make your gingerbread houses. 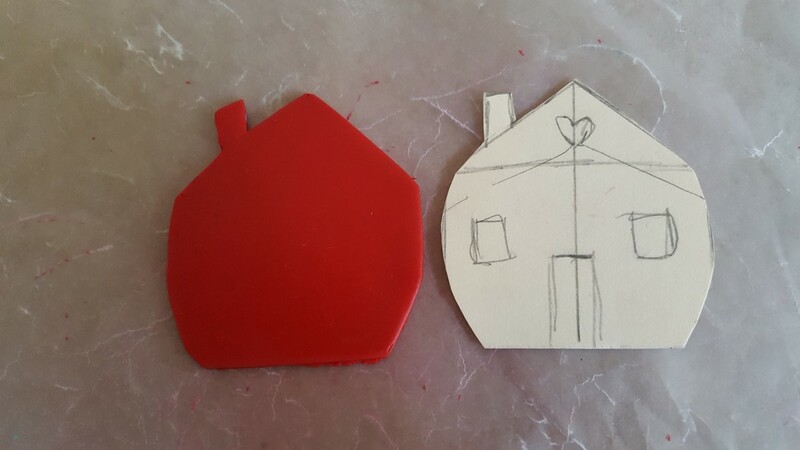 I drew a small stencil of my house, making it about 2 inches wide based on my calculations for my 4 repeats. I added a few architectural details to my template just so I'd know how I wanted my house to look. Step 2. Next, I rolled out my clay I planned to use for my houses. I rolled this clay out to about 1/8 of an inch. You can also stamp your clay with stamps or buttons to give them more texture and detail. Then I cut out my 4 house pieces. I made two houses in red and two in green, but you can make them all the same color or all in different colors. Step 3. (Optional) You can use a pen knife or little flathead screwdriver to cut out the details of your house. This will allow the optional filler inside your ornament to show through your houses. Smooth the edges of your cut outs with your tools for a finished look. I added a small heart opening to the top of each of my houses. To do this, I used a pen top (see photo) to make two small holes next to and touching each other. Then I used my pen knife to make a small V at the bottom to complete my heart. Step 4. To add some snow to my roof, I rolled out a small piece of white clay and stamped it with a few buttons. Then I cut this white snow into thin strips and placed it along the edge of the roof on each of my houses. I left the irregular edge of my rolled clay so that it looked more like snow on my roofs. You can add other clay details to your house too. I wish I had added some small white shutters to my windows and more stamp details. Step 5. 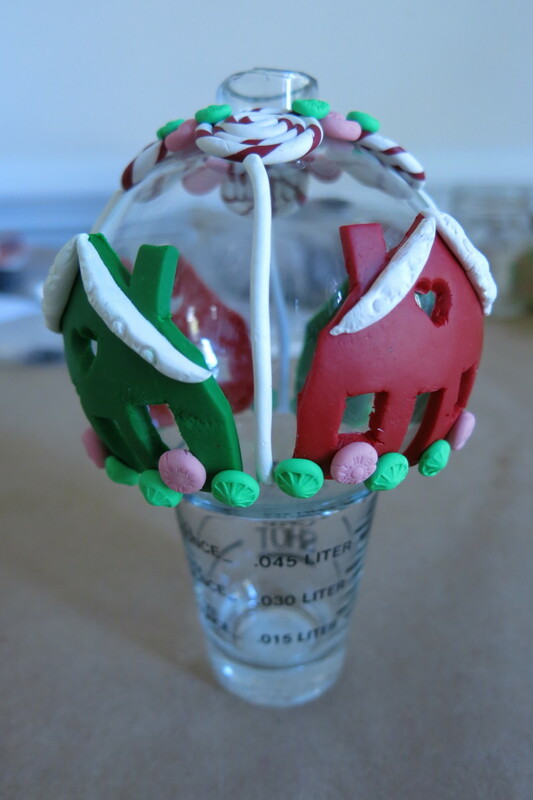 Before putting your houses on your glass ball, you should move your ornament to the structure that you will use for baking. 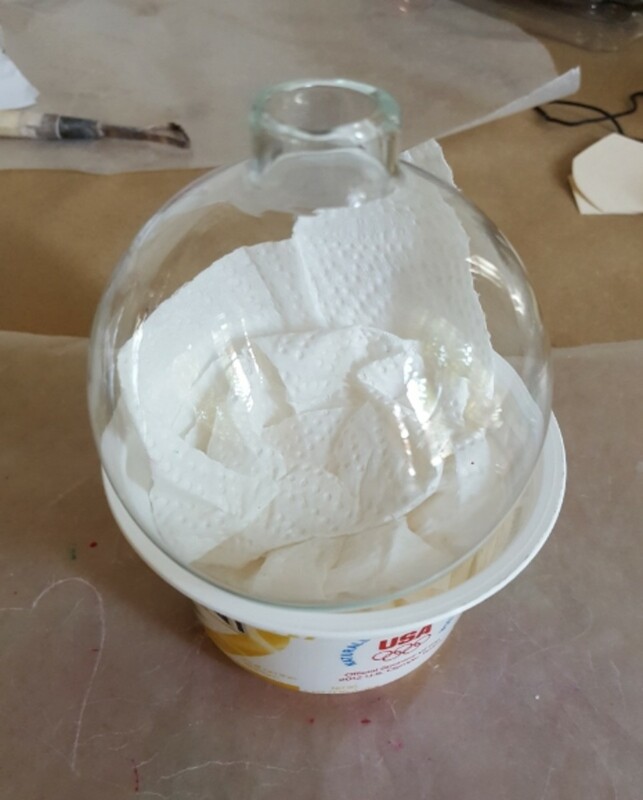 This glass or cup should be glass and have a small opening that will not touch your clay pieces at the bottom of your ornament. I used a small shot glass but there are probably other items you can use for baking. Step 6. Now place each of your houses on your glass ball. 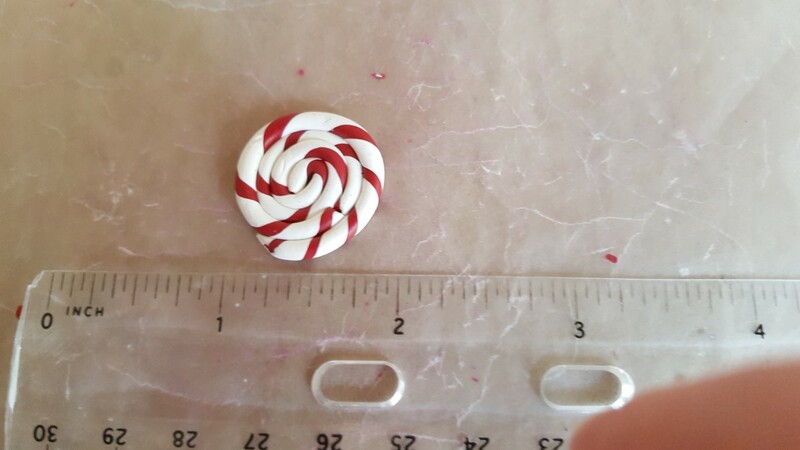 For this design, put them underneath and between each of your peppermint candies. 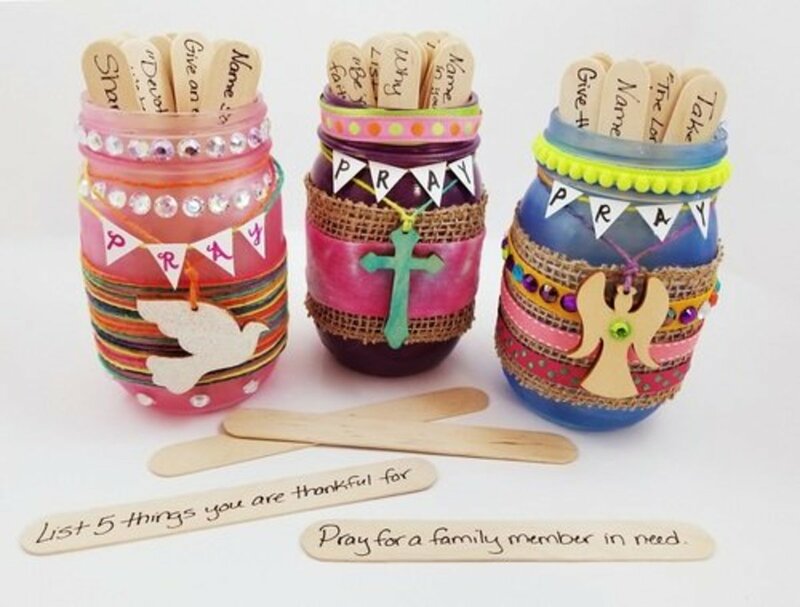 The lollipop sticks from your peppermints will be placed between each house as part of the decoration. 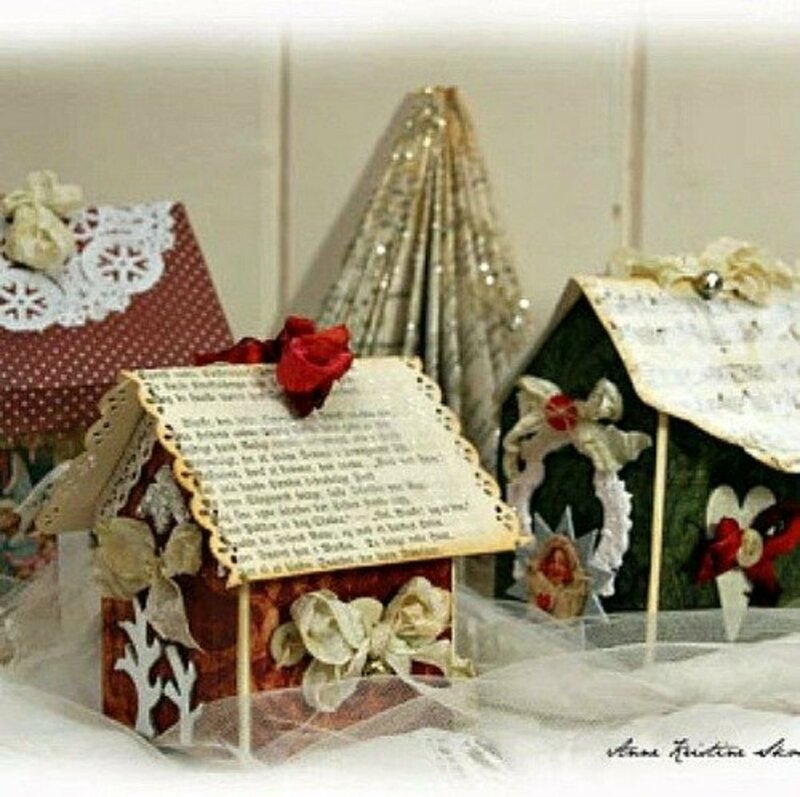 However, do not put your houses too close to the bottom of your ornament because it will have to rest in something for baking. Step 7. 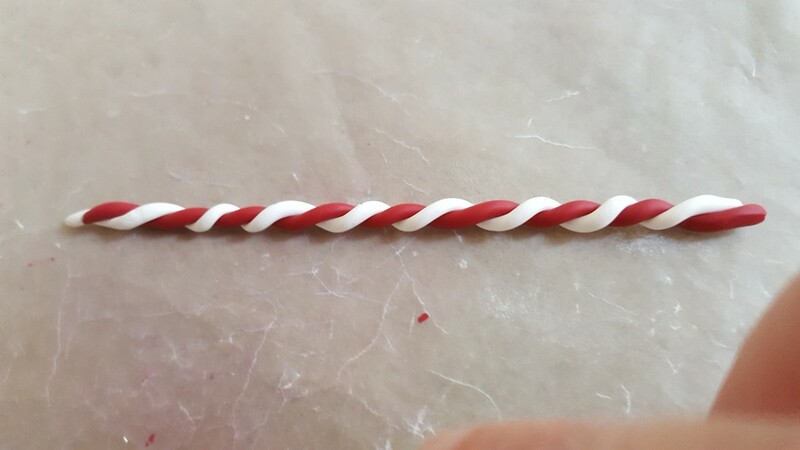 Roll some more thin coils of white clay to serve as your peppermint lollipop sticks. Cut the ends of your rolled clay so they have a clean edge. Place each one directly under each peppermint and run it between each of your houses. 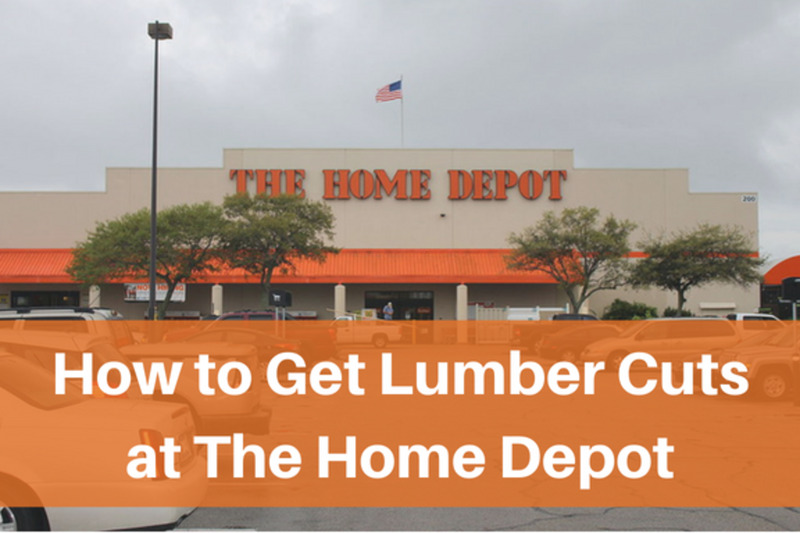 Cut the bottom edge so that it is even with the bottom edge of your houses. Step 8. 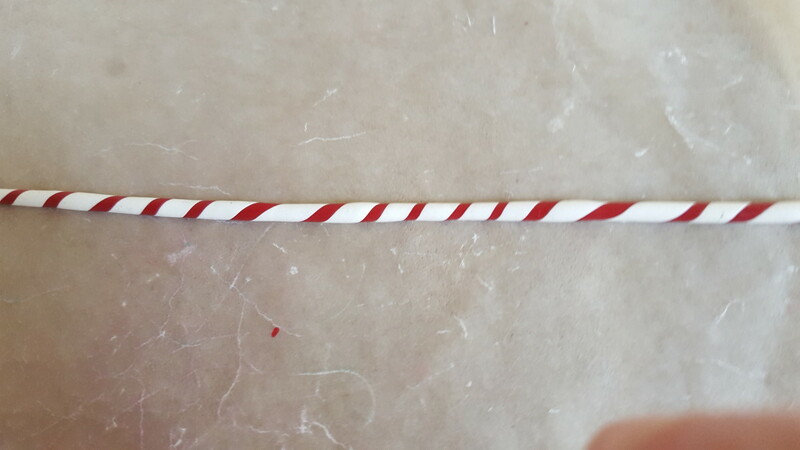 To connect your lollipop sticks with your houses and secure all your clay pieces, add some more candy dots to the bottom of your houses. I added some green bushes that overlapped my lollipop sticks and my houses. Then I put on some pink dots between my bushes for more color. Step 9. I should have added some puffs of smoke out of each of my chimneys that connected to my clay candies at the top of my ornament. This would have created more connection points to make sure my clay pieces would stay on my ornament. Step 10. When all the details are complete on your houses, bake your ornament (without the metal top) according to the directions on your clay's packaging. 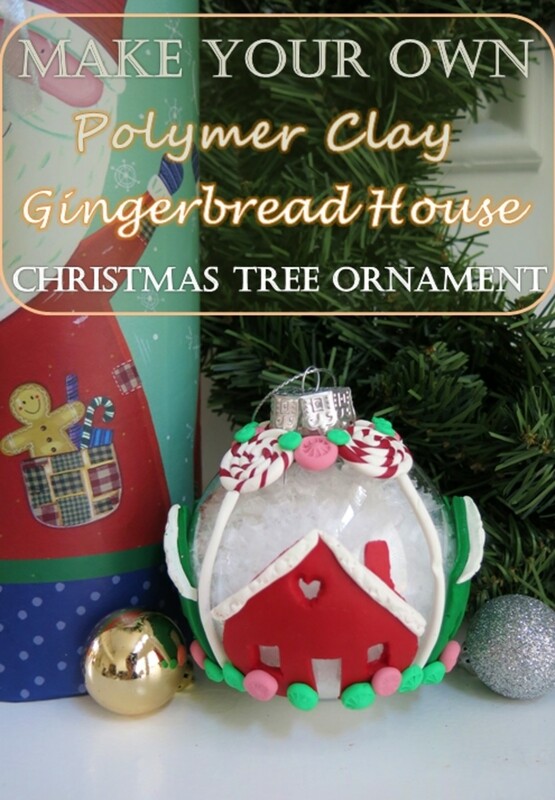 Again, Cindy Lietz's video has some good hints about baking your ornament (see link at top of tutorial). Step 11. Let your ornament cool completely before handling. Step 12. (Optional) Before putting your metal top back on your ornament, you can fill your glass ball with some fake snow, confetti, or glitter. This will add a little more winter fun to your gingerbread house decoration. Thanks, Rachel! I appreciate your comments and support. Hope you are cooking up something wonderfully delicious for Thanksgiving and Christmas! Hi Donna, Such pretty ornaments, as usual. You have a real knack for arts and crafts. I'll show my daughter this one. Thanks, Lynsey! I don't really consider this a project to do with kids as the polymer clay can be tricky to place and stick on the glass ornament. However, you could follow these directions, but use paper, buttons, and glue to create a similar design on a plastic ornament or styrofoam ball. Thanks for your comments and support! Thanks, Heidi! Yes, I believe the holidays are soon upon us. I'm excited, as I love holiday decorating and crafting. Hope you are staying busy. Thanks for your comments and have a wonderful holiday season!! These are actually adorable. What a great project to do with kids- could use so many varieties of the clay too! I'm sure there are sparkly versions! Aw, cute. Hard to believe it's that time of year again. Where did this year go? Anyway, thanks for sharing all your lovely and creative ideas with us! Thanks, Sally! As always, I appreciate your kind words and support. Looking forward to seeing more craft hubs from you! Such a cute Project Donna, Well done. Simple clear instructions as always and great photos, well done!